New Year’s Eve simply calls for some treats. 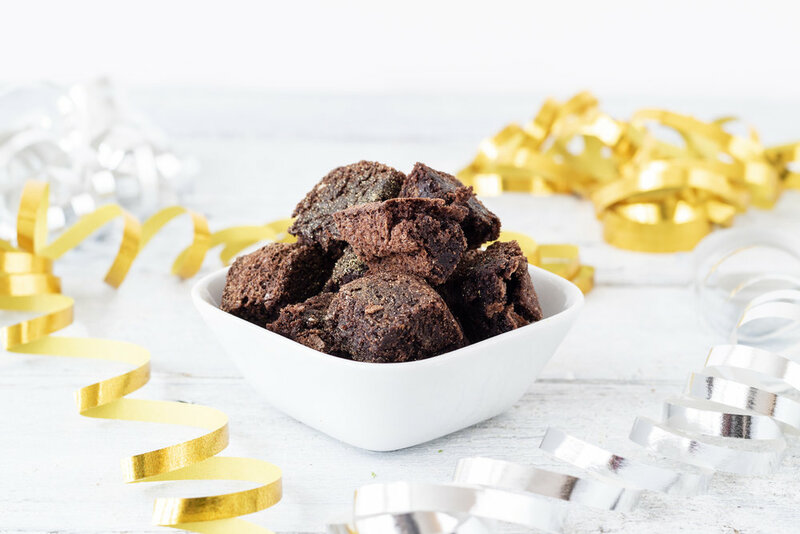 These easy to make scrumptious chocolate brownie bites will be the perfect sweet treat at your party. Blend the Dark Choc Zing granola until there are no bigger pieces visible anymore. Mix Dark Choc Zing granola together with flour, baking powder and cocoa. Whisk the eggs together with the sugar and vanilla in a large bowl. Melt the butter in the microwave or in a pot until completely melted. Add the butter to the egg mix and slowly add the flour-cocoa mix (spoon by spoon) until everything is smooth. Spray the 9 x 13 inch baking dish with cooking spray or alternatively insert a layer of baking paper. Pour the batter into the baking dish and put it in the oven on the middle rack and bake for 30 minutes. Make sure it's on the middle rack, not the top one. Leave in the oven for another 5 minutes. Take the tray out of the oven and let it cool down completely before cutting the brownie into brownie bites. Spoonie Tip: add some edible gold glitter on the brownies for an extra elegant touch.